The world's largest robotic telescope is to be developed by astrophysicists from Liverpool John Moores University (LJMU) with counterparts in Spain. Research teams have agreed to explore the design, construction and operation of a four-metre optical telescope in La Palma in the Canary Islands. The 2m (6.5ft) Liverpool Telescope (LT) in La Palma currently holds the record. The new telescope will be four times more sensitive and ten times faster then the LT, the university said. Scientists will be able to observe exploding stars, including supernovae and gamma ray bursts, and search for new planets. Professor Iain Steele from the Astrophysics Research Institute of LJMU said: "The timing of this agreement is perfect. "With new international discovery facilities... and the Large Synoptic Survey Telescope coming online over the next decade, a new high sensitivity spectroscopic capability is desperately needed." "The new telescope will fill that niche perfectly," he added. 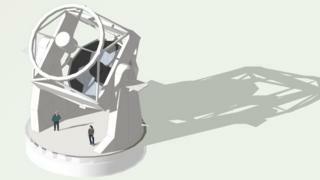 The National Schools Observatory will also give schoolchildren free access to the new telescope. The telescope is expected to be in use at the beginning of the next decade.